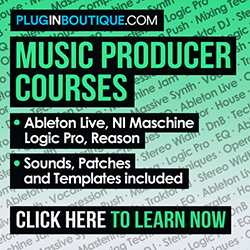 Ableton has so much to offer for live performances, arranging, composing ideas… you can assign anything to a midi keyboard, you can automate anything so easily it is an amazing DAW! We all know how scary and frustrating learning a new DAW can be… I went from GarageBand to Cubase to Reason and finally settled down with Ableton for the past 4 years. And the best part of this is that I can still use all the instruments I spent countless hours creating with Reason inside Ableton! It’s called Rewiring. Sounds scary but very simple. Reason is an amazing DAW that allows you to build instrument and effect racks by manually cabling them! This is how things are done in real studios or even live concerts. Your mixing table cabled to the mastering rack, then the synthesizer to the EQ and compressor rack, you can cable in a Reverb or other effects… It’s really important to know how audio and midi travels through cables instead of a simple computer where we just “drag and drop”. But who cares about learning the theory, you just want to have a big fat David Guetta bass… Well Reason has tremendous amount of presets for instruments (bass, violins, guitars, pianos, synths, pads…), effects, drum machines, loops which will make your headphones explode! The same way as a VST plugin such as Massive, Reason is a great tool to have. 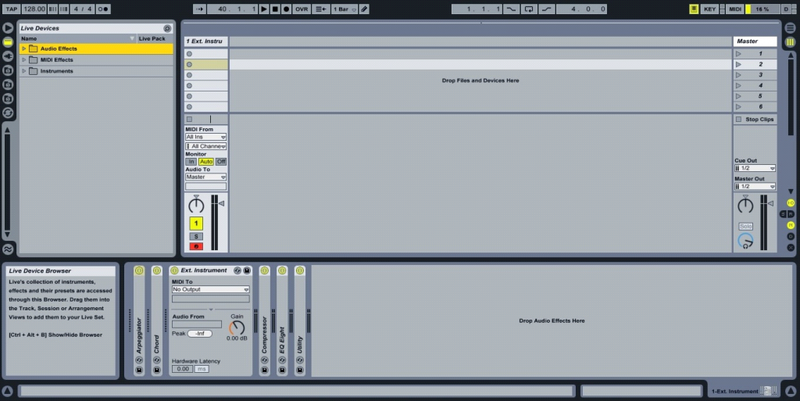 You will need to create a midi track in Ableton. 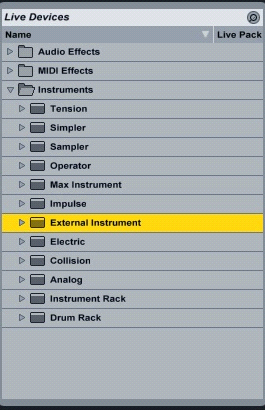 On that midi track you will drag and drop an “External Instrument”. Now we need to launch Reason inside Ableton. *It is very important to launch Ableton first, otherwise the rewiring process will not work. From your default Reason page erase the mixer and the mastering chain. We only want to use Reason’s instruments or effects, all of the arranging and mixing will be done in Ableton. Ableton is now your main DAW and Reason is nothing but a Slave (true terms…). For an Example, I’m going to create an instance of Thor with the “Fat Boy” preset inside of Reason. *I took off the mixer, master chain and dragged down the sequencer window which we don’t need since Ableton is our sequencer now. Rewiring process: What is going on? Here is where the “Rewiring” process begins. We need to connect the audio output of the Thor instrument to the external output of Reason. Sounds complicated but it is very easy. 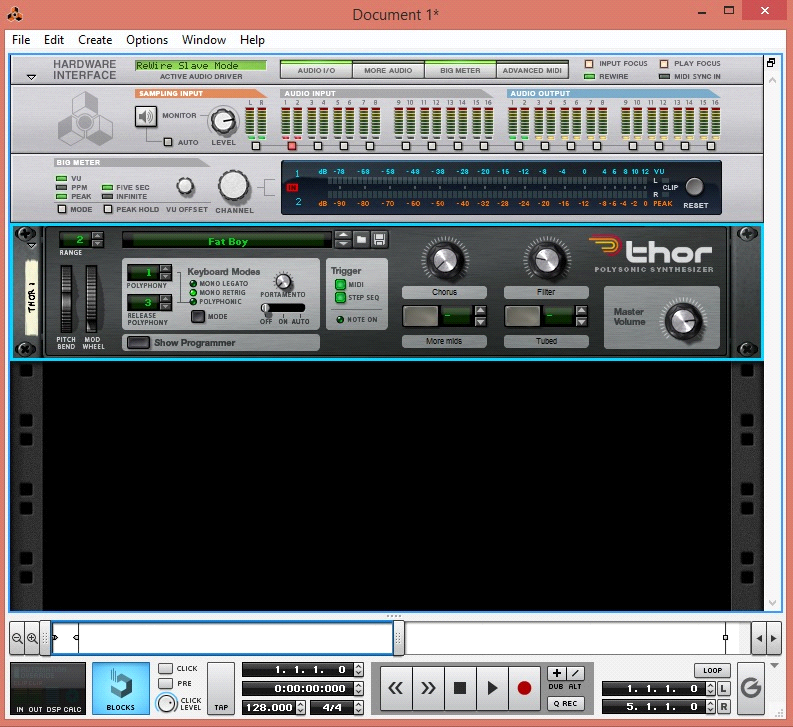 Reason is being used kind of as a VST instrument plugin. Which means we are sending the MIDI notes from Ableton to Reason and sending the final AUDIO from Reason back to Ableton. – First flip the rack over by pressing “tab” on your keyboard. This is where all the “cabling” happens inside of Reason. Play around with it, because it will be the same on real life instrument and effect racks found in professional studios. 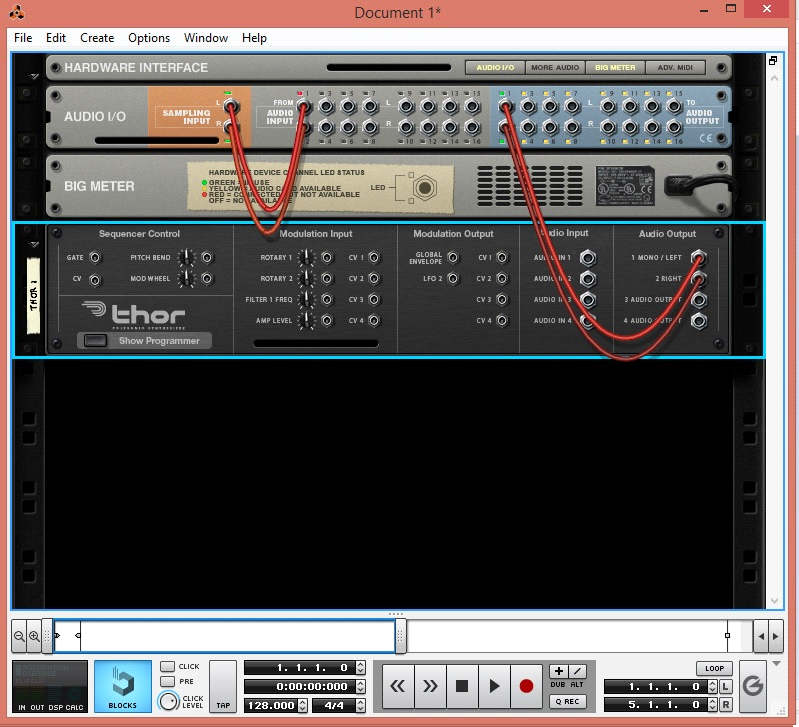 Also if you want to add Reason Effects, use an “Instrument rack” when you create your instruments so you can add your effects directly through it. It will make the rewiring process easier. 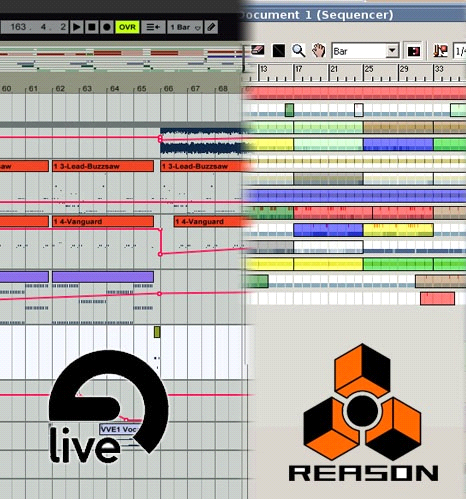 Reason is now set up with your favourite instrument, lets now take care of setting up your midi track in Ableton. As we said before, we are sending the Ableton’s Midi notes to Reason and retrieving the audio from Reason. Hope you have enjoyed and be creative!